Hand-Dipped Jasmine Tea Chocolates - Do You Know The Muffin Man? Notes: Some more lessons learned about making artisan chocolates: lining the pan with plastic wrap doesn't work very well when the surface is non-stick; freezing the ganache filling too long means the melted chocolate “foot” will set immediately making it hard to get an even thickness; cutting the frozen filling right out of the freezer led to cracking. 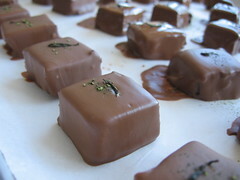 After my last experiment at infusing chocolates with jasmine tea, I was more pleased with the results of this recipe. The ganache is very very soft: I could barely pick up a square after it had been drying overnight at room temperature. I see why having the foot is useful. Sprinkling a bit of matcha on top sounded like a good idea, but it dissolved into dark spots.